As much a thought-leader as he is a revolutionary chef, the name Grant Achatz carries serious weight in the world’s most progressive kitchens. But long before he opened the Chicago temple of modernist cuisine, Alinea, he was just a six-year-old dishwasher at Achatz Depot—his parents’ eatery in Richmond, Michigan. Achatz worked in family restaurants through high school, eventually enrolling in the Culinary Institute of America in Hyde Park, New York. 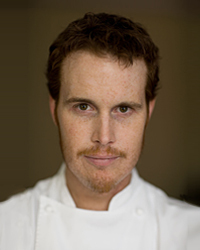 After graduating in 1994, Achatz spent four months at Charlie Trotter’ s in Chicago before leaving to eat his way through the three-Michelin-star restaurants of Europe. When he returned to the States he took a commis position at Thomas Keller’s French Laundry—eventually working his way up to sous-chef. After four years with Keller, Achatz returned to Illinois as executive chef of Trio. His work at the Evanston restaurant earned him a Best New Chef nod from Food & Wine in 2002. Two years later, Achatz was unpacking his alginates and anti-griddles at Alinea. “Before we opened I called a staff meeting and said, ‘We need to make this the best restaurant in the country because any thing else is simply unacceptable.’” he recalls. “That was my goal, but I could never have known that we would hit it.” Now, the chef’s expanding Windy City dominion also includes the state-of-the-art cocktail bar Aviary, and Next—a restaurant that reinvents itself every few months (previous “seasons” have focused on the foods of Paris 1906 and childhood). As he put the finishing touches on The Hunt, his forthcoming game menu at Next, Achatz sat down with Food & Wine to talk about acid, oysters and why experimental theater could be the future of fine dining. What recipe are you most famous for? My black truffle explosion—I formulated the idea for the dish when I was still at The French Laundry when I was pulling chilled duck confit. The natural gelatin from the skin and bones had formed what was basically a duck consommé. I looked at it and had one of those pivotal moments. I rolled off a pasta to make ravioli and put a little chunk of the duck gelée inside, tossed it in the water, and when it came out the filling had liquefied. When I was trying out for the job at Trio I tried the technique again [this time using a filling of] black truffle juice set with gelatin. That’s essentially what got me the job. We still serve the black truffle ravioli today at Alinea. It does that thing that all iconic signature dishes should do: It combines elements of surprise with elements of comfort. What dishes really tell your story as a chef? Alinea’s “hot potato, cold potato” really celebrates collaboration, which has always been incredibly important to our cuisine. I went to Martin Kastner (who designs the unique service pieces at Alinea) and told him that I wanted to make a course that was hot and cold at the same time. I asked him to help me create a piece that would allow for that. He came back to me a few weeks later with a tiny paraffin wax bowl the size of an oyster shell. We put cold black truffle-potato soup in the bowl. Then we put a stainless steel pin through the wax and stuck a hot potato sphere on the pin. It was such a simple design, it was brilliant. It also encouraged guest collaboration. They have to pick it up. They have to pull the pin like a grenade to release hot into cold. They are involved in making this a complete course, which I love. Alinea has always been about getting people involved. The second dish would be my pheasant with burning oak leaves. To me this dish really symbolizes the way a chef can tell a story with his food. I grew up in Michigan in the ’80s and at that time it was common in the autumn to rake the leaves, then light the piles on fire. So the smell of burning oak leaves reels me back to my childhood. That smell is Halloween and hayrides and trick or treating. When we were brainstorming a fall menu around 2006, I thought, Why can’t emotion become a seasoning? We took an oak branch with the leaves still attached and used it like a bamboo skewer, piercing a piece of pheasant, apple and a roasted shallot and then tempura frying it. We light the leaves on fire and blow them out so that when the dish arrives it is still smoldering. The entire thing is conceived around my childhood: Pheasant hunting with my father, apple picking with my family…it’s nostalgic. Finally there’s a presentation at the end of dinner in which we plate directly on the surface of each table; it’s a very significant expression of the way we think. Artists can paint anywhere from a tiny piece of canvas to something as big as a room. As chefs, why are we confined to the dimensions of a plate? We came up with a food-safe washable silicon sheet that acts as a tablecloth that we roll out for the very last course of the meal. Two chefs come out from the kitchen with ramekins of ingredients and they plate the final course on the table surface in front of guests. We bring the kitchen out to the dining room, just like old-school French places did. What is your favorite cookbook of all time? What is one cooking technique that everyone should know? I would go with blanching. A lot of people don’t understand the importance of properly seasoned water when they cook vegetables. The water needs to be seasoned with salt or in some cases, sugar. If you aren’t going to serve the vegetables immediately, they need to be shocked when they come out—thrown right into ice water and cooled down in a rapid fashion. You can’t throw something into 160 degree water, pull it out and let it sit, then wonder why it’s become mushy and brown. I’d say sherry vinegar. I think there’s a lack of appreciation for acid in our food, whether it be lemon, lime or vinegar. Just a drop here and there elevates flavors in a way that most home cooks just don’t understand. Sherry vinegar has a nice balance of those caramelly brown flavors and its more versatile than a white wine or red wine vinegar. I have to go with dried pasta. It’s incredibly convenient and easy to prepare. Put a whack of butter, salt and black pepper in there and you have a meal. If you could invest in a dream project, what would it be? I would create a restaurant that is thematically similar to Sleep No More (an elaborate and participatory immersive theater production of Macbeth staged in a New York City warehouse). Just like Sleep No More, we’d choose a theme and offer a sensory experience that involved actors, exploration and food in a giant space with many, many rooms. That would be my ultimate restaurant experience. You wouldn’t go in and sit down at a table. You would walk through a space touching, smelling, hearing and tasting. If I knew what that ingredient was I would already be using it! But I do think miso might be up and coming. The American public mostly thinks of miso as the generic supermarket stuff that’s basically just salt. But there are varieties of miso out there that have so many layers of flavor and characteristics that aren’t commonly found. Red miso has so much depth; that’s what I think people will gravitate toward. Pickles! Vlasic dill pickles. They are acidic, salty and cold out of the fridge. I just like anything pickled. I’m all about vinegar and salt. What is your go-to cocktail? Probably a margarita. A drink that’s all about salt and acid. Shocking. But I love negronis and daiquiris, too. They are hard to make well even though they contain only three ingredients. If you were going to take Anthony Bourdain out to eat, where would you take him and why? I would take Bourdain back to Alinea. He came around 2008 and said some complementary things about me. But he also made it very clear that he didn’t like his dinner here. I think he would get it more if he was with me. I wouldn’t want to manipulate him into liking it, but I would want a chance to explain to him why we do the things we do. Why Because his imaginative combinations, such as foie gras with roasted bananas in a chocolate-sweet onion sauce, aren't just risky; they're delicious, too. Born St. Clair, MI, 1974. Experience Charlie Trotter's, Chicago; French Laundry, Yountville, CA. How he describes his food Progressive French cuisine with global influences. "You could say ‘cerebral,’ but that's just too much." Most exotic item on his menu Rosemary vapor. "We pour boiling water over rosemary sprigs at the table, so it perfumes the air and adds a new level of complexity to our lobster dish." Culinary hero Thomas Keller, the chef at French Laundry. "He's concerned about everything, from how the food is seasoned to whether there are any gum wrappers littering the garden." Favorite childhood food Walleye. "My family lived on a river near the Great Lakes, and we used to go fishing a lot." Local haunt Potbelly Sandwich Works. "They have the best sandwiches in the world. I like the Wreck, a sub with everything on it." Bedside reading The Man Who Ate Everything by Jeffrey Steingarten, A Cook's Tour by Anthony Bourdain. Favorite kitchen tool Silicone-coated parchment paper from J.B. Prince (www.jbprince.com), which Achatz uses to make the tuiles that decorate some of his savory dishes. About his recipe Describing his watermelon salad with shrimp, Achatz says "I think shellfish benefits from a little sweetness." He suggests draining the fruit in a colander after you cut it, for a cleaner presentation.